As we prepare for the Cultural Alliance's Creative Placemaking Conference, Shaping Community Jan. 23-24, at Stepping Stones Museum, we are holding pre-conference sessions, preparing teams to attend the conference and work on placemaking project proposals. Our Bridgeport meeting attracted 38 people, Greenwich 29. Look out for meetings in Norwalk: Jan. 3; Fairfield: Jan. 4, Westport: Jan. 8; Stamford: Jan. 9, New Canaan: Jan 11; and Stratford, Jan. 15. Pictures from our first meeting in Bridgeport below. Check it out, rent a space, or add your own: it's free! Catch our next monthly Spotlight on Arts & Culture, on WPKN 89.5 and wpkn.org, Mon. Jan. 8, noon, with the economic and community development directors from local towns: Mark Barnhart (Fairfield), Thomas Madden (Stamford) and Rina Bakalar (Trumbull), discussing The Arts, Culture and Economic Development in Fairfield County as a lead-in to our Shaping Community conference Jan. 23-24. Also: catch our 2-minute Drive Time selections from the week’s E-Buzz on WPKN 89.5 FM and wpkn.org. Selected events from FCBuzz.org postings, can be heard as PSAs : 7-9am and 4-7pm, weekdays. Jay Petrow, who moved to Westport in 1992, has had a brilliant career as both an applied and a fine artist. With a BA in studio art and biology from Middlebury College, Jay later took courses at SVA in advertising art direction, and after short stints at Sports Illustrated and Time Magazine, he settled in at Business Week as an art director for 20 years. Always interested in landscaping, and wanting to apply some of his biology studies, Jay studied landscape design at the New York Botanical Garden and in 2007 he established his landscape design company, PetrowGardens Landscape Design. "Landscape design combines so many of my talents, skills and interests. When I design a garden I think about massed plants of one kind to create an area of a certain color and texture. I'm piecing together in my mind a composition. When you stare at a blank space you have to imagine where it can go. It's a journey, an exploration." Jay talks about how he turned fully to abstract work in response to, and express his experience of, fathering a child with autism. "The entire body of work approximates a place that I inhabit physically and psychologically. My goal in painting is to recreate on canvas what I am experiencing inside, from high states of agitation and angst to feelings of calm." Jay incorporates vibrant colors and layers textures on the canvas as he strives to reconstruct a path through his emotional world. Jay has furthered his studies at Silvermine School of Art, and was included in the 2014 and 2016 Silvermine Juried Student Exhibitions. He has had solo shows at the Westport Library (2014) and the Wilton Library (2015). He is a member of the Westport Artists Collective and was in a WAC Pop Up show this spring. See Jay's website and Instagram page. From the get-go, Pamela Stoddart has had a healthy left brain:right brain mix. Her BA from University of Colorado, Boulder, was in math and science, but she had always taken art classes to keep the balance. AFter graduating, she became engaged with the fashion industry, spending six years as a marketing coordinator for Liz Claiborne, before gravitating to the nonprofit world, while constantly painting. Moving to Ridgefield, Pam served on the board of the Ridgefield Guild of Artists (RGOA) for 7 years, until in 2014, she became its executive director. Pam says that she is essentially an abstract painter: "Everything I see, I want to paint in an abstract way. Some days it’s linear and some days it’s circular and fluid. I see things analytically and portray them creatively." She is constantly inspired by the objects in the world around her - and she is particularly drawn to flowers: "I start with a photograph or an image of a composition of a flower painting I was drawn to, but the finished product always evolves into an abstraction of the original." Pam still takes classes - at Silvermine and the Ridgefield Guild. She shows at the Ridgefield Guild (she won First Prize in RGOA's 2015 38th Annual Juried Exhibition) as well as in the Greenwich Arts Council's Art to the Avenue, Westport's Art About Town, the New Canaan Carriage Barn Arts Center, and in Bedford, NY. See her website, Facebook and Pinterest pages. Elizabeth Agresta, Anna Badini, Joyce Grasso, Joanie Landau and Lydia Larson are five of the new members of the Loft Artists Association being celebrated in the LAA New Member show: New Year New Art, opening Fri. Jan. 5, with a reception, 6-8pm. Co-director Mark Macrides commented: "We're excited to expand the organization with talented artists from local communities. Each of these artists brings a unique style and body of work to the LAA, as well as a high profile in the local art community." Heidi Coleman, Carol Nipomnich Dixon, and Ellen Gordon are three of the artists included in the Stamford Art Association's upcoming show, Faces and Figures, opening Sun. Jan. 7, 4-6pm. This annual regional exhibition was juried by Weiqing Yuan, an international artist and art instructor at the National Academy. Frances Ashforth, who won Best in Show in the Center for Contemporary Printmaking (CCP)'s 2016 Members Show, is being honored with a solo show in CCP's litho studio during the current Members' Show, Illumination. Frances decided to show her Water + Words exhibit (last seen locally at the New Canaan Library in March, click for details). At right Frances with master printer Christopher Shore. The show will be up until February 11. Binnie Birstein received an Honorable Mention from juror Peter Pettengill for her Halcyon (2017, silkscreen on washi on panel with encaustic) in the Center for Contemporary Printmaking's member show, Illumination. Binnie says she particulalry enjoyed hearing Pettingill's comments about the irony in her title and image. The exhibition will run through February 11, 2018. 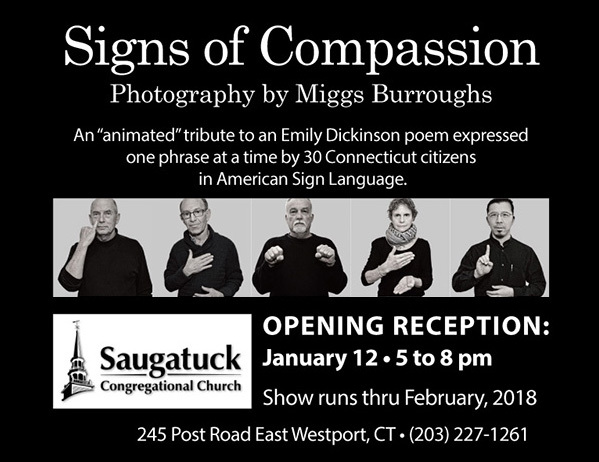 Miggs Burroughs' exhibition, Signs of Compassion, an "animated" tribute to an Emily Dickinson poem, expressed by 30 citizens in American Sign Language, traveled to the EBK Gallery in Hartford, and will open again at the Saugatuck Congregational Church on Fri. Jan. 12 with a reception, 5-8pm. Miggs also has work at the HiHo Motel in Fairfield. 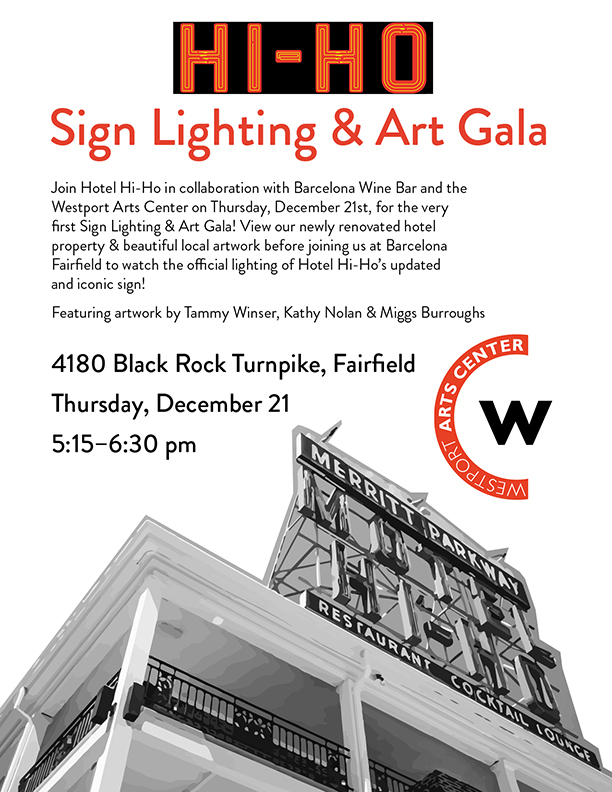 To celebrate the renovation of the iconic motel, the new owners worked with the Westport Arts Center and the Westport Artists Collective to show artworks in the lobby and new lounge. 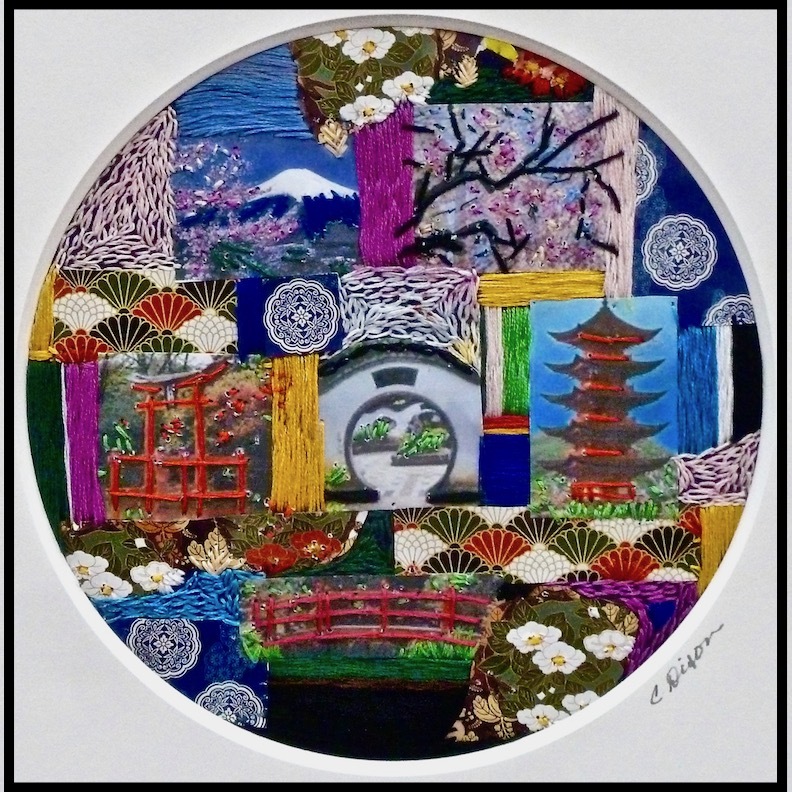 Carol Nipomnich Dixon has two mixed media embroidered collages on view in the Holiday Show of the Art Society of Old Greenwich at the Gertrude White Gallery of the Greenwich YWCA, 259 East Putnam Avenue, Greenwich, through Dec. 30, 2018. At right, Japanese Garden (2017, 13” square framed). Click for larger image. Carol also had a color photograph Billboard Portrait (2017, 14” x 11” )accepted for the Stamford Art Association's Faces and Figures exhibit, opening Sun. Jan. 7. Ellen Gordon will will be showing 8 of her mixed media figurative collages and her alter ego series in Cultural Alliance associate member, First Street Gallery's Pop-Up: On and Off the Wall opening Thurs. Jan. 11, 6-8pm (526 West 26 St, New York City). At right, Untitled, Alter Ego series (2017, mixed media, 21" x 18"). Click for larger, complete image. Ellen also has a mixed media. work, Portrait of Contemplation in the Faces and Figures show at SAA, opening Sun. Jan. 7. Joanie Landau will be showing 3 pieces at the Loft Artists Association New Year New Art Show, opening Fri. January 5th, 6-8pm. One of the pieces is I’m Not Famous (dDigital collagraph printed on archival ink jet paper, face mounted to 1/4” Plexiglass, 30" x 40", limited edition of 15, detail at right, click for complete image). Joanie comments that "In this age of a 24/7 gossip cycle, fame may no longer hold the same cachet as it once did. Being examined in the public spotlight is hard enough, but fame in the digital age can be devastating. “I’m Not Famous” is a statement on the 21st century pitfalls of stardom." Eric Jiaju Lee is the subject of a sparkling piece by Christina Hennessy in the Dec. 15 CT Post. In Traditional Chinese art forms inspire Greenwich artist’s modern approach, Christina discusses Eric's evolving balance between the traditions he was brought up in and the world in which he finds himself. Discussing paintings he did during a Lake George residency, she writes: "His modern approach reflects the fluid, calligraphic strokes of ancient Chinese artists that came to represent mountains, valleys and flora, yet his colors and technique are centuries away.... His works are not so much a depiction of landscape as his response to what he has seen." Another balancing act is Eric's illustrations for a book co-written by Yale physicist Sarah Demers and Emily Coates, Director of Dance Studies at Yale. Working in Chinese ink and brush, he has created drawings that combine elements of figurative drawing with scientific diagrams to illustrate the book, due out early next year. Read the article here. 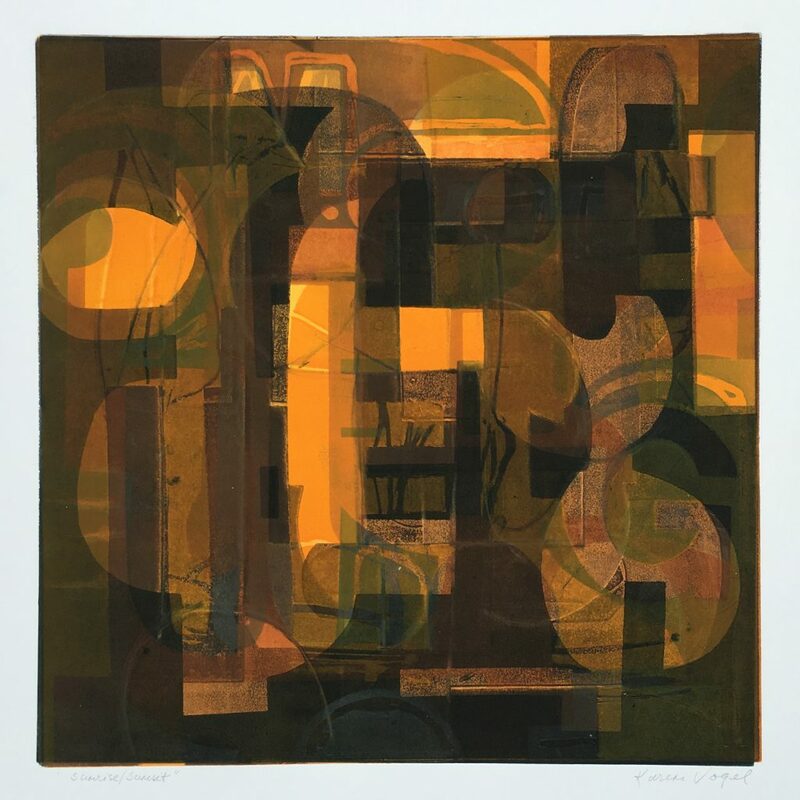 Karen Vogel’s 2017 monoprint, Sunrise/Sunset, at right, click for larger image) won Best in Show in The Center for Contemporary Printmaking's 2017 members’ exhibition, Illumination. Peter Pettengill, founder and director of Wingate Studio in Hinsdale, New Hampshire juried the show. The exhibition will run through February 11, 2018. Thur. Jan 11: Pop-Up On and Off The Wall, First Street Gallery, 526, W. 26 St., NYC. (Ellen Gordon). Fri. Jan. 12: Miggs Burroughs, Signs of Compassion, Saugatuck Congregational Church. Opening Reception, 5-8pm. Sotheby's employees pose with $ by artists Tim Noble and Sue Webster. Image courtesy Adrian Dennis//AFP/ Getty Images. A new study, The Artfinder Independent Art Market Report: 2017, commissioned by Artfinder, and conducted by the British a-n arts support consultancy group, reveals that 75% of artists in the U.S. make less than $10,000 from sales of their work. Close to half (48.7 percent) made $5,000 or less. Eileen Kinsella in A New Study Shows That Most Artists Make Very Little Money, in Artnet News, Nov. 29, reports that the study was based on data from 1,533 self-identified working artists in the US and the UK, surveyed over the first three weeks of November 2017. Artfinder CEO Jonas Almgren considered that today “You have more supply - and demand has not really caught up yet.” Nearly half of the artists surveyed (47 percent) said their artistic practice accounted for less than 25 percent of their total income, according to the report. Circumstances are even worse for women: 83.6 percent of the female artists surveyed earned less than $10,000 from their art, as compared with 77 percent of male artists. An interesting side note was the geographic range of the cities where the surveyed artists worked. For the US, the top 10 cities for artists per capita were Miami (581 artists per million), Portland (500), and Denver (250), with New York coming in eighth. However of course while Miami may have three times as many artists per capita as New York, New York is almost 20 times the size of Miami and has some 1,600 working artists, compared to Miami's 250. The Crow Show 2018 is the fourth annual exhibition of visual arts running from February 2 – 25, 2018, at The Studio Door (San Diego, CA). The Studio Door seeks artwork that represents the many faces of the crow in reality and fantasy. Having taken on mythological importance, crows appear in all parts of the world. In folklore, they may foreshadow tragedy or usher in good news. The reality is a highly intelligent bird capable of social interactions. In recent years, the crow has become a muse to many artists. Show us what the Crow means to you. Creative interpretations of all black birds, ravens and other Corvus species are acceptable. Juror: Roxana Velasquez, Executive Director of The San Diego Museum of Art. Artists can enter up to three pieces for consideration. Payment of $35 per initial entry and $5 for per additional media. [1 work of art = $35; 2 works = $40; or 3 works = $45]. See links to past catalogs here. For more information, and to apply via Café, click here. The New England Fashion+Design Association (NEF+DA) has announced a call for participation in the First Norwalk Children’s Arts and Design Festival - May 7-12, 2018. NEF+DA believes in giving chances to young talent - its own students, trained in fashion design from basics to advanced are offered many real life opportunities from internships to part time jobs in local fashion design studios.to participation in students’ fashion collections and events with prominent guests in the industry. Entries are encouraged in youth theater, children’s exhibits, fashion shows, concerts, and modern dance and ballet performances. The Festival is designed to be a showcase of Norwalk's young talent and the teachers and mentors training them in their craft. NEF+DA seeks partners that are passionate and eager to participate in bringing this fun initiative to our community. Timetable: Deadline for submission of proposals, January 10, 2018; first participants' meeting at NEF+DA, January 17. Send all ideas, submissions and enquiries by emailing Kyla or calling 203 345-0030. The Fairfield Museum and History Center invites professional, serious amateur, and student photographers from Connecticut, New York, Rhode Island, and Massachusetts to submit entries for the IMAGES 2018 Juried Photography exhibition. The exhibit provides an excellent opportunity for artists to connect with prominent collectors, gallery owners, fellow photographers, and the public. A jury of artists, photographers, and curators selects approximately 40 submitted photographs for exhibition in the show, which will be on view at the Fairfield Museum and History Center from March 1 to April 15, 2018. Artists in the Professional/Serious Amateur and Student categories may submit their work for consideration under the following subjects: Landscape, Portrait, Nature, Abstract, and Architecture. The Viewer's Choice photo winner will join the jury's selections at the IMAGES 2018 show at the Fairfield Museum. If you do not want your submitted photograph to be viewed publicly, or you do not wish to participate in Viewer's Choice, then please select those "opt-out" options when applying. A jury will choose one photographer from the Professional/Serious Amateur category and one from the Student category as the Grand Prize Winners. The award for the Professional/Serious Amateur winner is a gallery show in Southport Galleries. The Student Grand Prize winner will receive a portfolio review. IMAGES 2018 is presented in memory of Marcia B. Saft. A former Fairfield Museum Board Member and devoted community leader and philanthropist, Marcia Saft (1945-2016) was an enthusiastic supporter of Fairfield’s history and artistic legacy. Deadlines: Save $25 by submitting an early bird entry -- due by midnight January 23, 2018. The deadline for all other entries is February 6 (after January 23, a one-time late fee of $25 will be added, whether you have one entry or many). Anyone who is a professional communicator and either lives or works in Connecticut is eligible to enter (you can join the Conn. Press Club when you enter the contest). Work published from January 1 through December 31, 2017 is eligible. There are 64 categories, including personal blogs, books, editing and page design, photography, websites, social media campaigns, TV, radio, and more. If you have questions, email this year's contest director, Ucu Jillert Wiersma, and if he can't help, we'll put you in touch with someone at NFPW who can. The Harvestworks New Works Residency (New York) is a national program that offers artists up to $5000 to make a new work in the Technology, Engineering, Art and Music (TEAM) lab. Each artist receives up to a $2000 artist fee with the balance of the award used for TEAM lab activities including research and development, sound and image production, programming and prototyping. The artist works with a team comprised of Harvestworks’ Project Manager and consultants, technicians or instructors. The proposed projects should explore new aesthetic premises and push the boundaries of conventional art forms and media. [Special Initiatives: The Harvestworks Creative Residency Program in Emerging Technology will commission artists using emerging technology such as biosensors, immersive audio and video, virtual and augmented reality, camera and eye tracking systems, data sonification or visualization, mobile, new computer interfaces and controllers and new ways to engage with social media and communities. Composers are encouraged to apply to explore new technology for space and spatialization of sound in contemporary music.] How to apply: Projects may be realized through multiple channel audio or video installations, live performances with interactive performance systems and live processing methods, data visualization as single or multiple channel video or computer images and hardware hacking or circuit bending as custom built interfaces or instruments. Project descriptions may include developing a new work for music, theater, media art and interdisciplinary performance; experimenting with new creative concepts, approaches, or methods and researching and developing new technology for use in performance (e.g. musical instrument invention or preparing technology for an existing premiere performance) or exhibition. Up to 12 residencies will be selected (depending on project size and funding) along with up to five project scholarships. Priority will be given to the creative use of the Harvestworks’ production facility and the innovative use of sound, image and emerging technology. Apply here. The Provincetown Community Compact, Inc. (The Compact) was established in 1993 by Jay Critchley as a community-building and philanthropic organization to support the vitality of a changing community. The mission of The Compact is to nurture the health and cultural well being of Provincetown and the Lower Cape towns of Truro and Wellfleet – its people, the natural environment and the economy. The Compact also acts as a grass-roots incubator (Think-ubator) for social, environmental and artistic projects. The Compact has envisioned Provincetown as a Cultural Sanctuary. As such, our projects express the connection between the arts, the community, the economy and the environment. The Compact's projects strengthen the interdependence of people and place in order to nurture the creative process and promote sustainability.The Compact is pleased to offer stays in the historic dune shacks Fowler and C-Scape from April to November through an agreement with the Cape Cod National Seashore. While stays in the shacks are open to all, 14 out of 60 weeks weeks are set aside for selected artists, writers and organizations. A $500 fellowship is offered to one Artist In Residence and partially subsidized weeks for three jury-selected visual artists. Each year two weeks for writers are funded as well. Visual artists can apply for 1 of 3 juried summer 3-week residencies - one of these has a $500 fellowship. Park Service weekly walking tours expose visitors to the experiences of the artist and their work. To apply, upload: a resume; 3-5 images of your original work; and a statement about how living & working in the dunes will enhance your work. Writers can apply for 2, one-week residencies, and are selected by lottery. To apply submit 1-2 page artist statement or resume; and 3-5 pages of your writing for records. Read The Compact mission statement and fill out the application form. Please join us in support of these national historic treasures. Apply here. I-Park is now accepting applications for its 2018 artists-in-residence program. Forty-four fully funded residencies are available between May and December, and range in duration from two to four weeks. The residencies are open to artists and designers working in visual arts, creative writing, music composition/sound art, moving image and architecture/landscape design. Located within a 450-acre nature preserve in rural East Haddam, Connecticut (U.S.), I-Park provides residents with a quiet, retreat-type setting, private living quarters in a renovated 1840s farmhouse, a private studio, meals program, fully equipped workshop and modest library—as well as creative access to I-Park’s expansive grounds. Residencies are self-directed, undisturbed and non-judgmental. You decide what you’re working on and when. This year, I-Park will also be offering $500 travel grants to eight international residents. The CT Office of the Arts is now accepting new artists to the Directory of Teaching Artists roster. Teaching artists are individual practicing artists who specialize in teaching both in the classroom and in the community. There is no requirement for teaching artists to be certified teachers. CT Office of the Arts is committed to advancing arts learning through high quality arts engagement, integration, arts exploration, creation, and discovery experiences. The Directory of Teaching Artists is a reliable resource of high-quality Connecticut teaching artists who have been juried for excellence in their art forms and readiness and capacity to work in schools and community settings. Directory teaching artists are teaching partners. Interested artists should review the guidelines and contact Bonnie Koba with questions. Volunteer Lawyers for the Arts (VLA)-NY provides pro bono arts-related legal representation and education to low-income artists and nonprofit arts and cultural organizations. VLA-NY services CT and NJ artists and organizations, although assistance to Connecticut artists/organizations is subject to attorney availability. If you have an issue that you need legal assistance with, call The Art Law Line, 212.319.2787 x1 and complete an Intake Form. Also consult the very useful list of FAQs. Fairfield Museum and History Center seeks an energetic, and visionary, part time Director of Community Programs to coordinate, cooperatively plan, and implement a new series of multi-sector, innovative and fun family and adult programs, art installations, and performances that will provide participants meaningful opportunities to delve deeply into their community’s identity and take an active role in creating a more inclusive future. The Director of Community Programs will convene and lead community planning groups; design and develop collaborative programming that gives voice to multiple perspectives; develop and sustain partnerships with regional arts, performance and cultural organizations; and oversee the delivery of programs, lectures, community forums, art installations and performances that advance the Museum’s mission to use the arts and humanities to strengthen community and help shape its future. Programs will occur primarily at the Fairfield Museum and seasonally on the adjacent outdoor Museum Commons. Qualifications include the ability to demonstrate broad and successful experience in facilitating and leading collaborative planning; implementing creative, diverse and dynamic indoor and outdoor programming that builds new audiences; experience in developing and sustaining relationships with community groups; have strong connections in the Connecticut and New York arts, education, and social service communities; demonstrate strong organizational skills; and be independently motivated and a strong team player. Bachelor’s degree and a minimum of 3 years of experience in a related field required. How to Apply: Please mail or email a cover letter and resume detailing relevant work and program development experience by January 26, 2018 to Director of Community Programs Search, Fairfield Museum and History Center, 370 Beach Road, Fairfield, CT 06824. Email: lreilly@fairfieldhs.org. No calls please. EOE. Position to begin in March, 2018. The Aldrich Contemporary Art Museum, seeks a Digital Media Coordinator to work with diverse Museum departments—exhibitions, education, membership, development, events, and visitor services—and to actively organize and archive content and update The Aldrich’s newly redesigned website to ensure that timely and accurate information is posted in a way to make the site dynamic, accessible, and engaging. This position will also schedule, develop, and format all Aldrich e-newsletters across all departments, and create and manage a digital archive of all exhibitions, programs, and events. Responsibilities will include: format content for, regularly review, update, and maintain the Museum’s website; update, review, and maintain online retail and ticketing platforms; develop online outreach materials; digitize archival material as necessary to create a robust exhibition history for the Museum’s website; participate in regular meetings with external affairs, education, and exhibitions staff to identify e-blast and website needs; archive and track all exhibition, program, event, and institutional video/photography; create and maintain online exhibitions archive, including PDFs of Aldrich publications; develop illustrated exhibition checklists; and more. Requirements include: fluent in Photoshop (InDesign and Illustrator a plus), with a strong understanding of producing and optimizing media for the web; ability to collaborate well; comfortable working with a broad range of Museum personnel, including curators, educators, technology designers, and development, marketing, and communications staff; effective written and verbal communication skills; excellent organizational and problem-solving skills; and more. The successful candidate will also demonstrate a commitment to the Museum’s mission, to working to advance its position within the museum field, and the ability to advocate effectively for the Museum and its goals in professional and social settings. Position available immediately. Please send a cover letter and resume to: jobs@aldrichart.org, with the subject line “Digital Media Coordinator.” Qualified candidates will be contacted. No phone calls, please. Kate Callahan, at left, finishes her two-year term as Connecticut State Troubadour in 2018 and The Connecticut Office of the Arts is currently accepting nominations for the position. The State Troubadour serves as an ambassador of music and song and promotes cultural literacy among Connecticut citizens. The honorary position of Connecticut State Troubadour was established in 1991 by the State of Connecticut. An individual singer-songwriter must be nominated and deemed eligible to apply. The deadline for nominations is January 15, 2018 with applications due February 15, 2018.